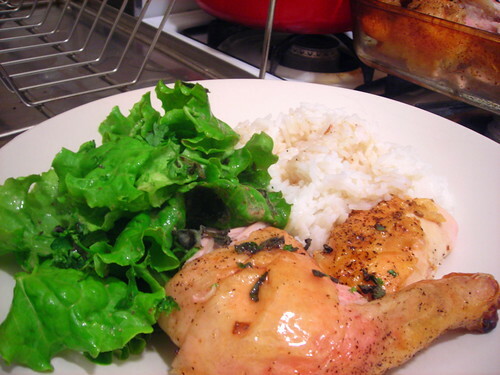 Roast chicken is extremely economical. One bird can theoretically provide dinner for nearly a week, especially when you’re cooking for one person. Tuesday: Very likely a ragout of chicken, shallots and shiitake mushrooms in a red wine sauce, over egg noodles. Wednesday: Maybe chicken salad sandwiches. It’ll give me a good excuse to make homemade mayonnaise and blog about it. Assuming I’m not all chickened out, Thursday will probably feature congee using the scraps and trimmings. Friday I’ll make stock from the carcass and freeze that for future use. Dinner will likely be something OTHER than chicken though. Chef Judy Rogers, formerly of Chez Panisse in Berkeley, California, is the chef and co-owner of Zuni Café in San Francisco, California. The Café presents a re-interpretation of traditional French and Italian cuisine seen through the prism of extraordinarily fresh seasonal produce obtained throughout the year. One of Chef Rogers’ signature dishes (made famous in part by The Zuni Café Cookbook) is her Zuni Roast Chicken with Bread Salad. You can view the recipe here. I adapted it and made a couple of changes along the way. 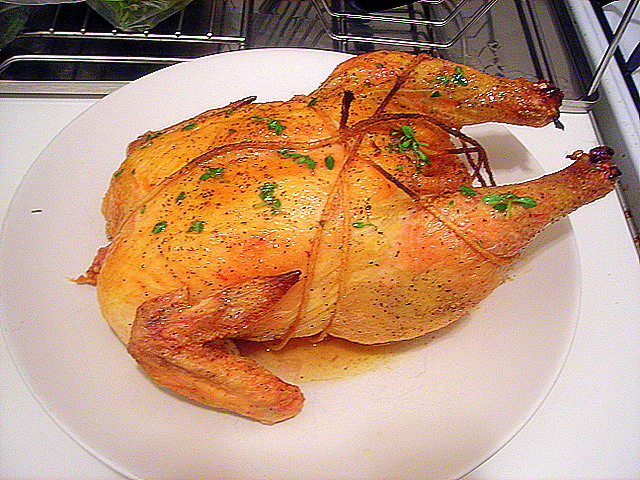 My preferred method for roasting a chicken is via Thomas Keller’s recipe for poulet rôti. As you can see in the pics below, this results in an extremely succulent bird with tissue-paper thin, shatteringly crisp chicken skin. 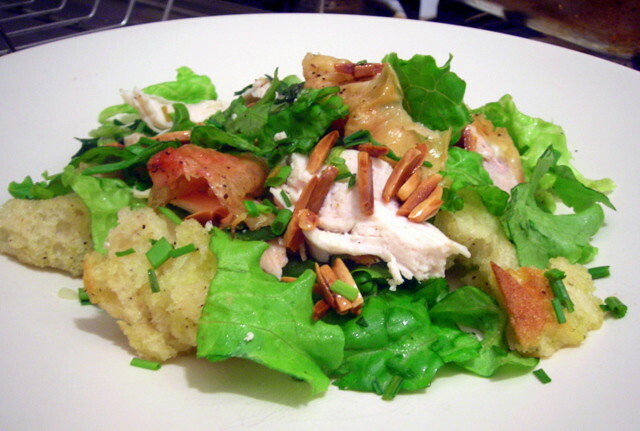 As for the bread salad, this was made using leftover roast chicken. Golden raisins were substituted in place of dried currants; toasted slivered almonds instead of pine nuts. The salad features onion chives, sage leaves, lamb’s quarters (also known as wild spinach) and green leaf lettuce. The vinaigrette consists of herb-infused white wine vinegar, re-heated pan drippings and extra-virgin olive oil from Sicily. 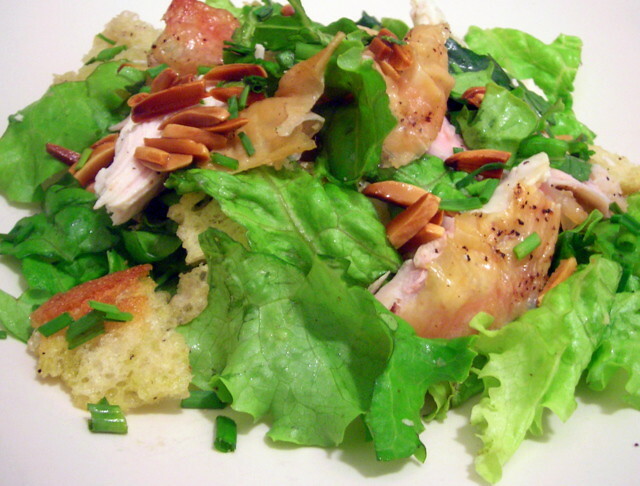 Made as written, the chicken and bread salad takes about an hour and a half, prep time included. If you use leftovers as I did, it takes roughly 30 minutes from start to finish. 31 May	This entry was published on May 31, 2010 at 9:35 pm. It’s filed under food, general, summer and tagged bread, California, cooking, dinner, food, free-range chicken, Judy Rogers, lamb's quarters, lettuce, organic, roast chicken, salad, San Francisco, seasonal and local, slow food, sustainable, Thomas Keller, Zuni Cafe, Zuni Cafe Cookbook. Bookmark the permalink. Follow any comments here with the RSS feed for this post.